Get your thumbs on the LG Octane for Verizon Wireless and enjoy effortless on-the-go messaging and updates to your social networks. Slim and sleek, the candybar-style Octane's back flips open to reveal a full QWERTY keyboard and 2.6-inch internal color LCD. It also features an HTML web browser and a Favorites Key that enables you to connect with your ten most frequent contacts in a flash. The LG Octane is compatible with the V Cast Music with Rhapsody service, which enables you to purchase songs through your phone and download them via the fast Verizon Wireless 3G EV-DO data network, and the V CAST Video on Demand service that enables you to watch full-length TV shows plus news, sports, weather, and live entertainment video clips. You'll also stay on course thanks to the VZ Navigator GPS turn-by-turn direction service. And with the optional Visual Voice Mail service, you'll be able to quickly and easily scroll through your messages and pick the ones you want to listen to. 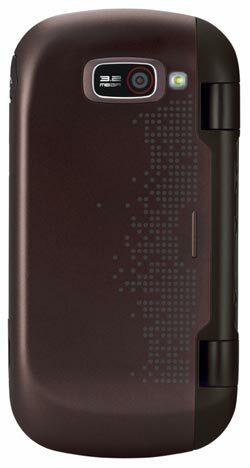 Other features include a 3.2-megapixel camera/camcorder, Bluetooth for hands-free devices and stereo music streaming, microSD memory expansion (up to 16 GB), multi-format music player, personal organizer tools, compatibility with Skype Wi-Fi calling, threaded text messaging, and up to 6.3 hours of talk time. Social Beat Widget offers a single point for accessing social networking sites, allowing you to stay connected to Facebook, Twitter, and MySpace plus more than 50 news, sports, and entertainment feeds. Skype Mobile compatibility provides unlimited Skype-to-Skype calls and IM while in the U.S. to anywhere in the world. Plus, with Skype Mobile you get low rates to international land lines and cell phones (requires Skype account). 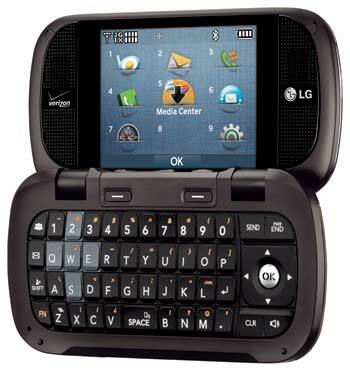 Internal 2.6-inch LCD screen (320 x 240 pixels, 262K color depth) viewable when flipped open to reveal QWERTY keyboard. Video capture capabilities with two resolution options, smile shot function that automatically takes a picture when a smile is detected, panorama mode, customizable brightness and white balance, image editor, and dual display activation for self portraits. Music player with music library, repeat and shuffle features. Compatible with MP3, WMA, and unprotected AAC/AAC+ formats. Memory expansion via microSD card slot with support for optional cards up to 16 GB. Threaded bubble messaging groups messages to/from a contact in time order and wrapped in bubbles. 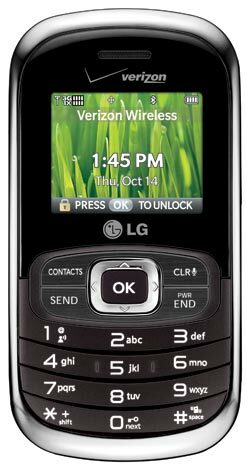 The LG Octane weighs 4.5 ounces and measures 4.21 x 2.16 x 0.63 inches. Its lithium-ion battery is rated at up to 6.3 hours of talk time, and up to 340 hours (14+ days) of standby time. It runs on the CDMA 800/1900 frequencies as well as EV-DO, Rev A 3G frequencies. Reliable 3G Network: With support for the EV-DO high-speed data standard, you'll enjoy fast access to the Internet and Verizon Wireless multimedia services (additional charges applicable), with average download speeds ranging from 400 to 700 Kbps and peak rates up to 2 Mbps. V CAST Music with Rhapsody: Access this exclusive digital music service for RealNetworks and for MTV Networks, which delivers unlimited monthly access to music on up to three Rhapsody-compatible mobile phones and players and online on multiple PCs and Web browsers. For a monthly fee (billed on your Verizon Wireless bill), you can load and reload your subscription songs from your PC to your V CAST Music with Rhapsody phone as often as you want, and take your music on the go. On PCs running the Windows XP or higher operating system, you can also browse, preview, and purchase music using the V CAST Music with Rhapsody software, which is available as a free download from the V CAST Music with Rhapsody download website. Additional subscription charges applicable. Mobile Broadband Connect: Use your smartphone as a modem for your notebook when you connect the two using a USB cable--or open a Bluetooth connection--enabling you to access the Internet or your company intranet. The Mobile Broadband Connect tethered modem capability is ideal when you're traveling and need to use your notebook to check e-mail, access corporate networks, or download large files like presentations and reports. And with Mobile Broadband Connect, you won't have to buy an extra PC Card or other devices. Family Locator: Securely locate your family members' locations from your Verizon Wireless device or the web. The locate feature provides you with the information you need to stay aware and stay in touch, including detailed location information and the address of your family members displayed on an interactive map and the option to receive turn-by-turn driving directions to your family member's location using VZ Navigator. You can also receive updates when your family members leave or arrive at locations that you define such as school, soccer practice, or home, with monitored locations set up within a 1/4-, 1/2-, or a 1-mile radius. VZW Backup Assistant: Automatically back up your mobile contacts to your online address book. If your phone is lost, stolen, or damaged, or you decide to upgrade, easily restore your saved address book to your new phone. You can also add, delete, edit, and print your contacts online and send the changes to your mobile phone.